Part of the Quintet Office Park and an old acquaintance of ours, as we took care of maintenance for them a couple of years before. We are happy to have this fine building back in our stock and can clean the windows and frames regularly. We are already maintaining the other two buildings of the Quintet Complex, Quintet Office Park I & II. In the heart of Beatrixkwartier in The Hague stands the Monarch I. This is the first building that was built in the complex. The Monarch Tower is next to it and the third tower is currently being built. 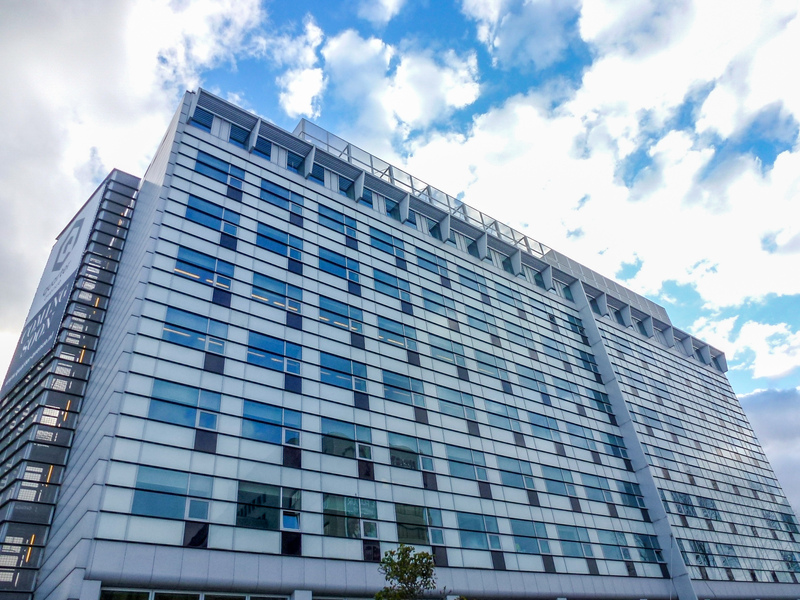 We have maintained the Monarch I right from the start and are glad that the contract has been renewed and that we can clean the windows and clean and preserve the frames of tenant CAK on a regular basis, and also take care of the cleaning of the parking garage. This building is not only a star, but a gem as well. NOW is a sustainable multi-tenant office building and a striking icon at the entrance of Park 20|20. 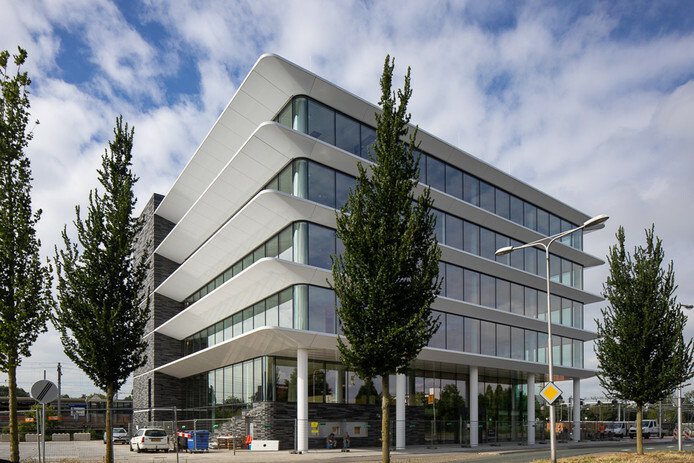 This is the first full-service cradle-to-cradle office park in the Netherlands, designed by William McDonough, inventor of the C2C principle. Natural materials have been used in the building: the construction is partly made of wood and the façade closure contains CO2-absorbent ceramic tiles. It is not for nothing that the building was BREEAM Excellent certified. Our work activities: (excellent) regular glass cleaning. 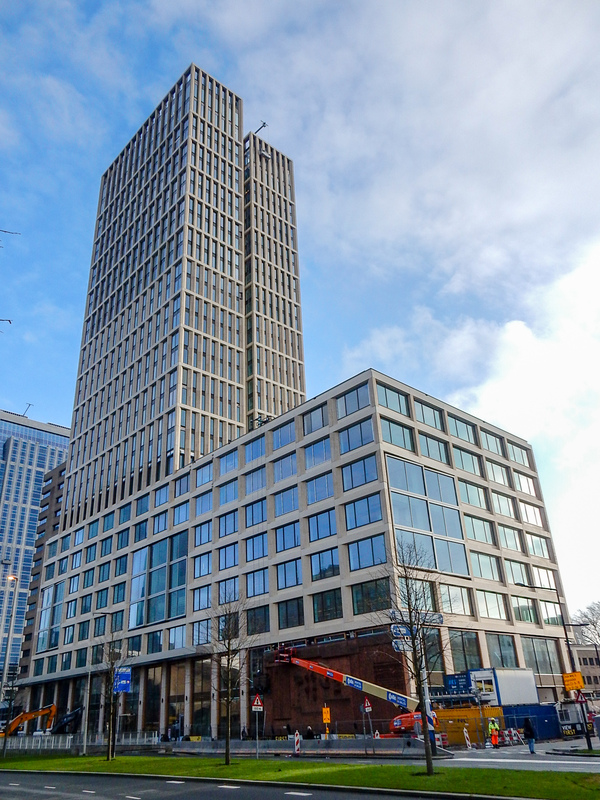 From 1 January onward we will maintain not one, not two, but four buildings at the Amsterdam Zuidas. To the ITO Building, the SOM Building and Vinoly, the FOZ Building on Gustav Mahlerlaan has been added. The building was designed by Foreign Office Architects, but taken over and developed as a project by Van den Oever Zaaijer & Partners. The whole has a surface area of c. 13,000 m2 of office space. Due to the articulation of the façade with glass and stone strips, the building seems to have much more floors than the six it actually has. Each floor is hidden behind two glass strips and two stone bands. Normally that is one window strip per floor. Another fun fact is that the choice of the fenestration was inspired by the special lighting that is so characteristic of the paintings of Dutch master painter Vermeer. The use of two different strips of glass in combination with a ceiling height of 2.8 metres creates a very special daylight entry. The upper strip admits a large amount of light that can penetrate deep into the office, whereas the lower strip offers the view. With our regular glass cleaning we ensure that light entry remains special and generous! 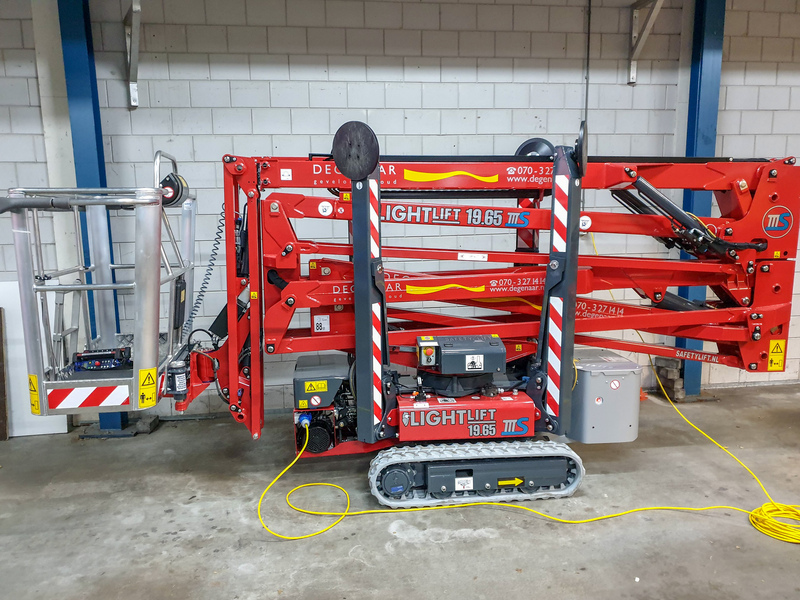 We have added a new lift platform to our machine park: the Hinowa Lighlift 19.65 L-i. An electrically driven lift platform equipped with a Lithium-ion package that fits in perfectly with our aim of making work processes more sustainable. Thanks to this battery it can operate cable-free all day and is much more silent. Besides, the machine has a number of additional fine properties. Thanks to the absence of a combustion engine it is light-weight: only 2,150 kg. Thanks to its compact dimensions it fits through virtually any door in transport position, has a surface area of 3.5x3.5 metres and can still reach a work height of c. 19 metres, which makes it the perfect machine for performing work in, for instance, atriums. 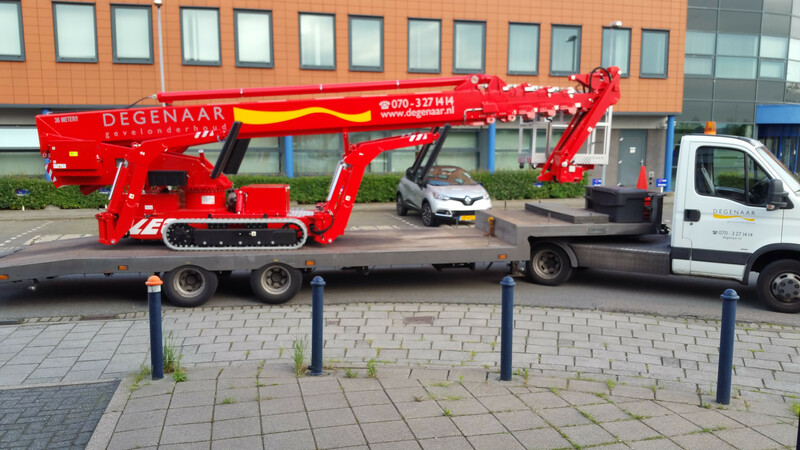 We are very happy with Safetylift BV from Leimuiden, which has delivered the machine to us in a very correct way. Who doesn’t know TomTom? 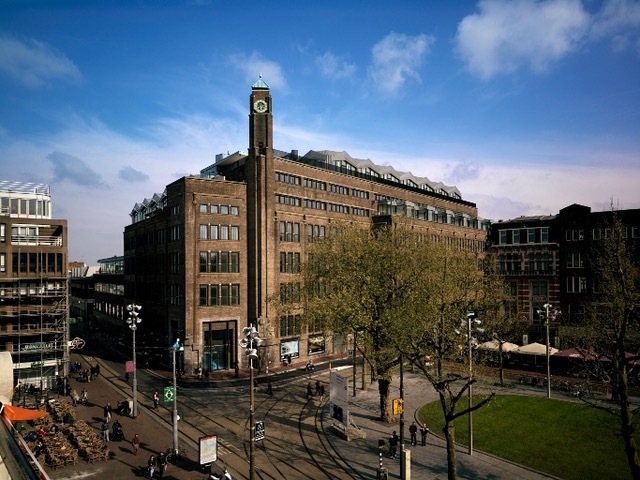 It is located at the Hollandia office building at Oosterdokseiland in Amsterdam. The building and the entire area have been developed by Meyer Bergman and MAB. 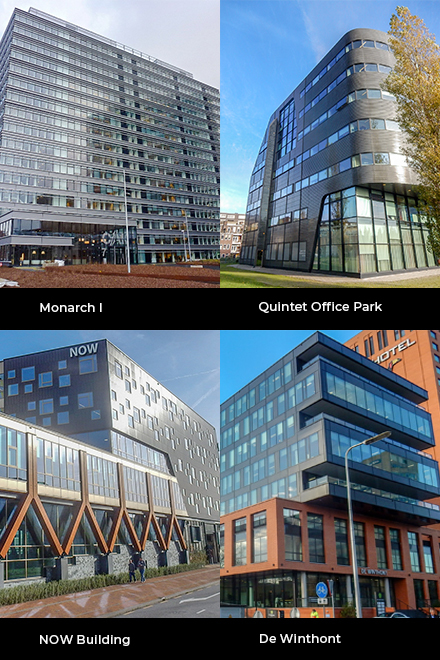 Oosterdokseiland, with its 225,000 m², is one of the largest inner-city projects in Western-Europe. It contains a total of 72,500m2, with public facilities, apartments and office space. The area is still under development and is estimated to be finished late 2020. 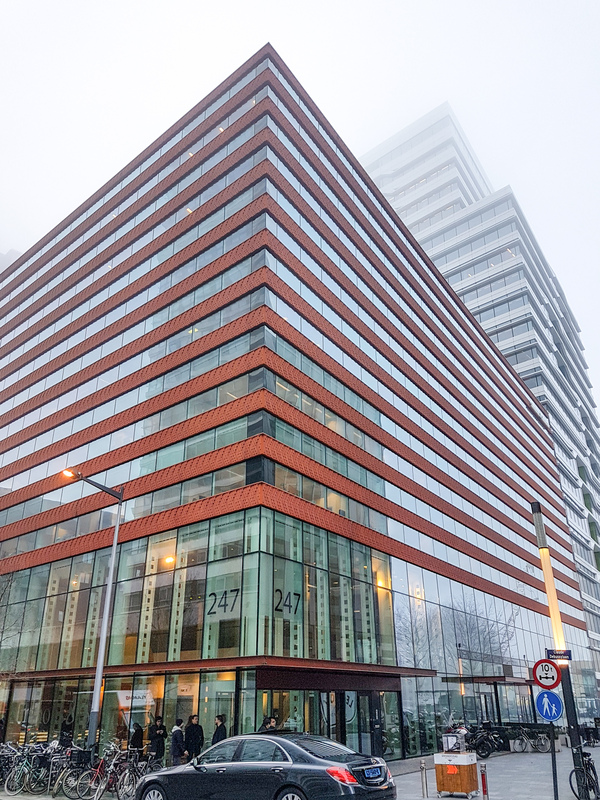 Hollandia was built in 2007, from a design by former Chief Government Architect Jo Coenen. 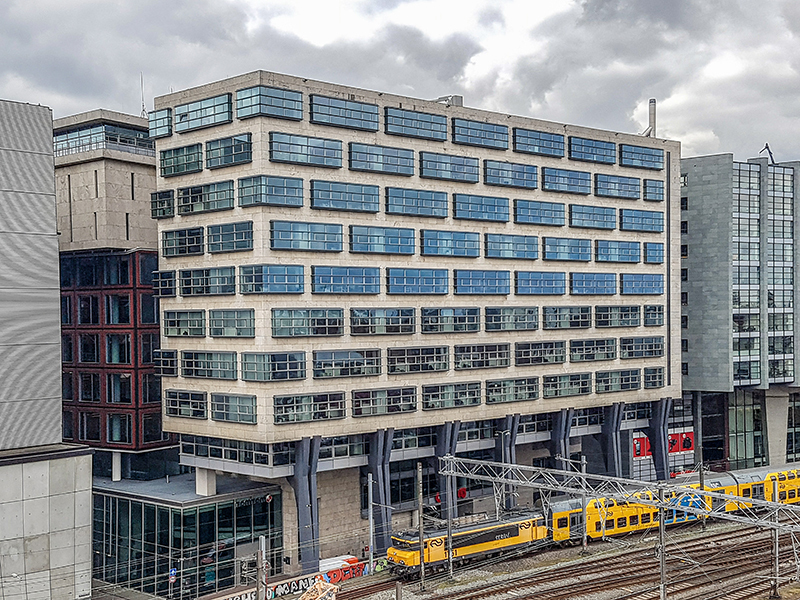 The building is located in the centre of Amsterdam (always a nice challenge when working with hydraulic platforms) and offers an amazing view of the environment and waterfront. 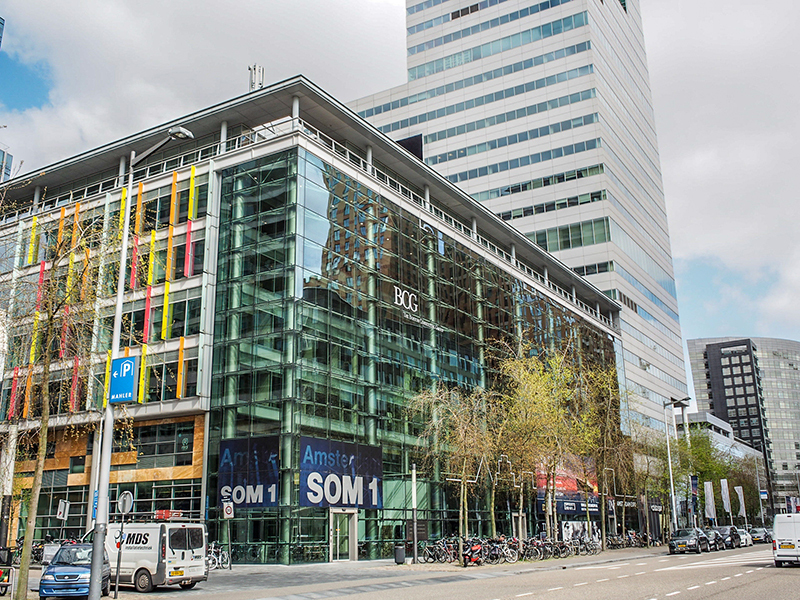 TomTom International BV is the only tenant to use Hollandia’s 9,950 m2 in office space. In 2017, Degenaar Gevelhoud was allowed to clean and preserve the metal parts of their façade. We also took care of parts of the façade made of natural stone. We have now been able to add regular window cleaning on contractual basis. A beautiful assignment that we’re very happy with. 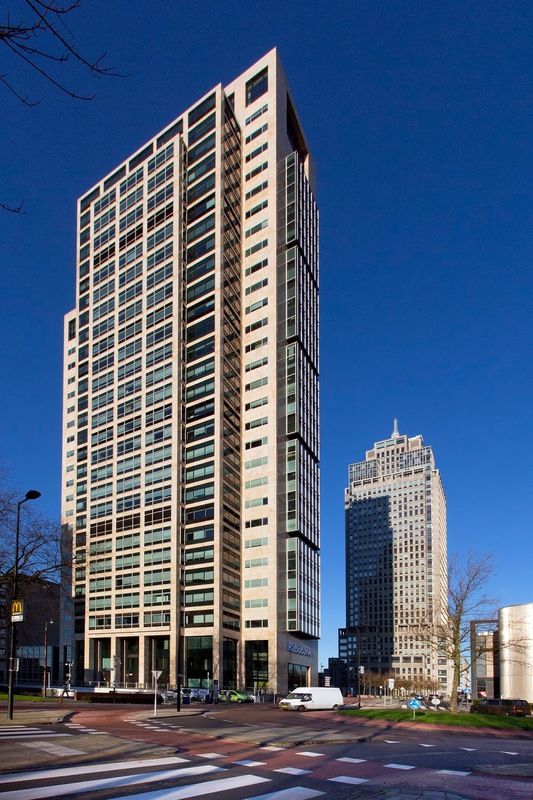 Our Hague heart beats a little faster, because we can now regularly provide both the Hague Tower, also called the Strijkijzer (‘clothes iron’) by locals, and ‘The Y’ with clean windows. And those are quite a few! The first impression is always the most important. You can only get it right once. FIRST Rotterdam definitely does so, if only because you can’t miss the 128 metre high office building right across from Rotterdam Central. 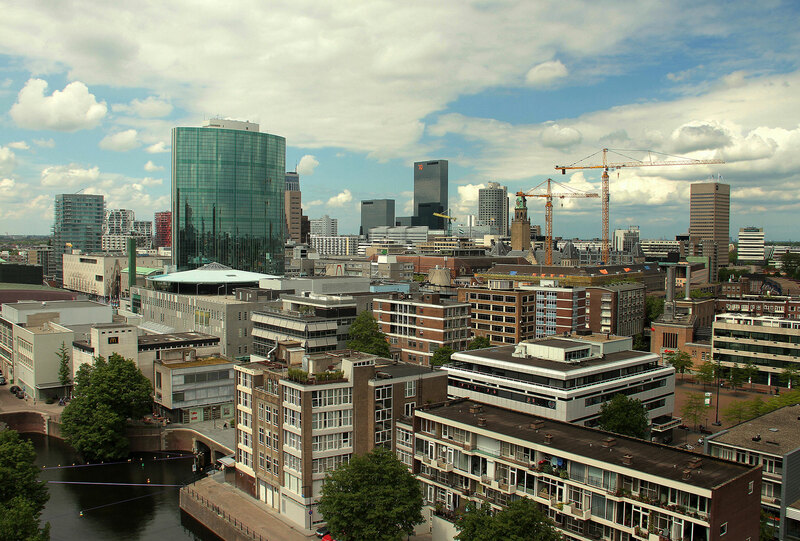 It’s the seventh highest building in Rotterdam, has an extremely high level of quality and excellent facilities. Additionally, FIRST Rotterdam has received the “Excellent” certificate from BREEAM-NL for sustainable installations within the building. Building commenced in December 2012 and was completed late 2015. The impressive (load-bearing) façade is covered with natural stone, composite concrete and glass and the design is inspired by the Groothandelsgebouw on the other end of the street. On the lower side of the façade, one can find the artwork Wall Relief No. 1, which is made from 16,000 clinkers. The two lower floors incline inwardly on the southside, so the monumental dome belonging to the former Bouwcentrum didn’t have to be demolished. In 2017 maintenance was quite far behind and we were tasked with leaving all windows spotless. In doing this, we once again made a great first impression, because we’re proud to announce that we can add this beautiful building to our list of permanent projects. A year ago, we were allowed to clean the metal parts of the ITO tower and the SOM building for the first time as well as preserve those of the ITO tower. Luckily, new property manager Savills was satisfied with the results and converted the job to a permanent contract to clean the windows on a regular basis. We look forward to continuing the work. 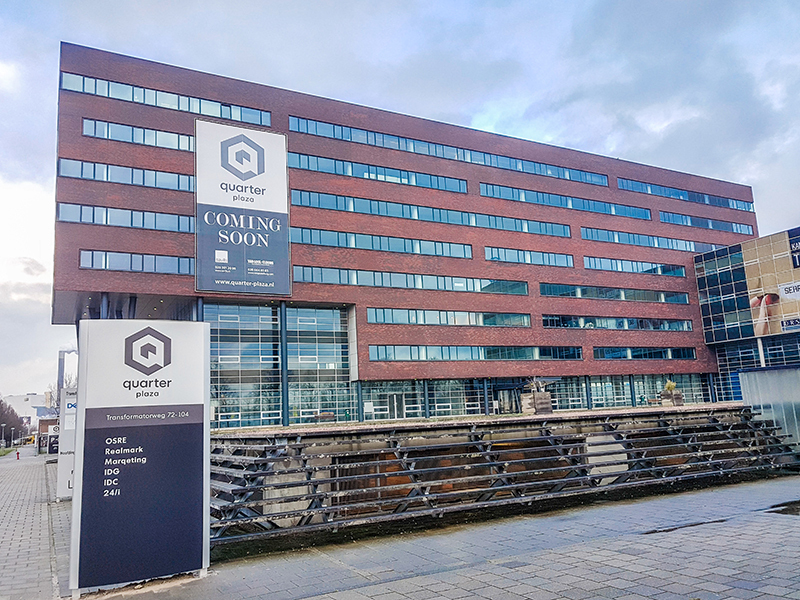 We already had Quarter Podium (previously Spectrum) under contract for regular maintenance and now, it is joined by Quarter Plaza and Quarter Avenue. 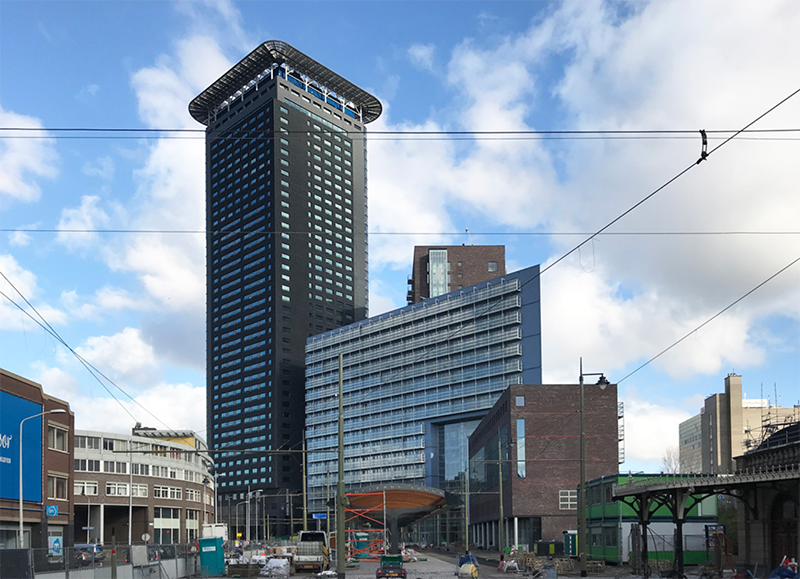 The three buildings are part of Quarter Offices, a new high-end working, living and play concept in Amsterdam Sloterdijk that was opened in May 2018. The three buildings have been completely renovated to improve their quality and functionality. The users, varying from big to small companies, start-ups and flex workers, can now very comfortably work, meet and relax here. Regardless of which building they’re in, they can use the extensive service package. From a manned reception area in every building, a business and meeting centre, restaurants, coffee bar, bikes, boot camps up to networking events, workshops, package storage, dry cleaning and room service. Comfort and hospitality are key. Naturally, such a concept demands beautiful façades and clean windows for a beautiful view. We are proud to provide the tenants with just that. There are buildings, and there are BUILDINGS. The Mondriaan tower in Amsterdam certainly falls into the latter category together with the Rembrandt tower, the Breitner tower and the future Amstel tower, and this skyscraper dominates the Amsterdam skyline. 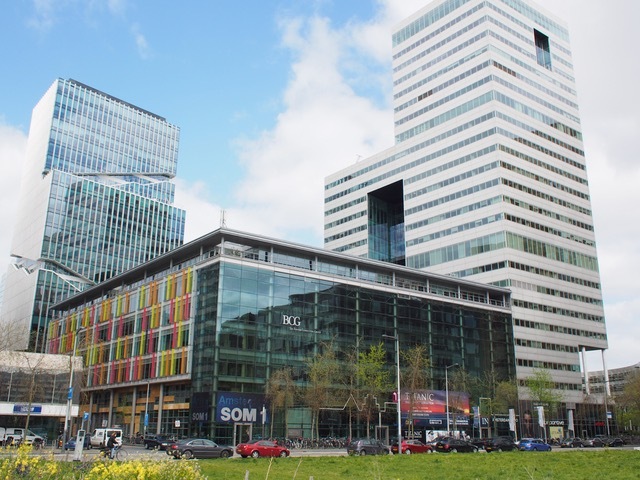 The Mondriaan tower is 120 metres high and has 30 floors of offices. The Rembrandt tower has 36 floors and the Breitner tower 23 floors. We are therefore delighted to add this behemoth to our project list from 1 July. 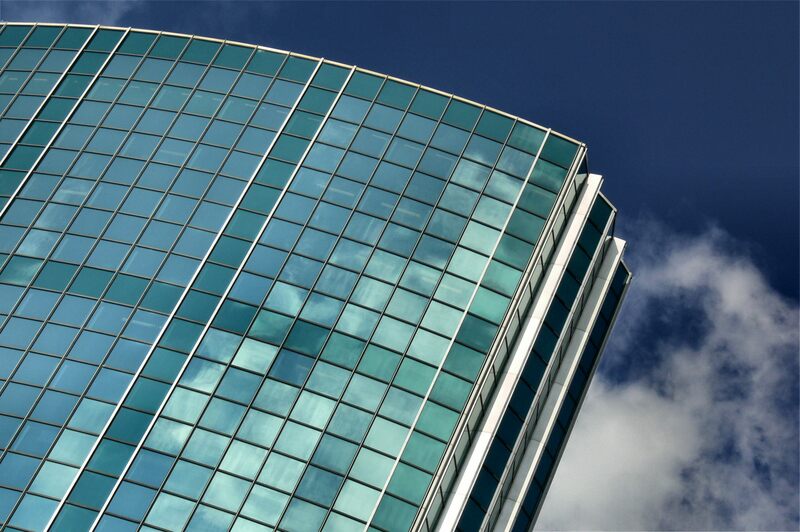 We will clean the windows on a regular basis for CBRE and owner NL Mondriaan Property 8 B.V. The three towers are named after famous Dutch painters. We as a company are originally from The Hague, therefore we feel extra pride when an assignment from a genuine icon from The Hague such as De Kroon is tendered to us. After a successful test clean in 2016, we recently became the first company to carry out a complete service in almost five years with the assistance of a special facade installation. This quickly became a permanent contract for the maintenance of the inaccessible glass of the Owners Association (VvE) from the 18th floor to the 39th floor(!) and that is a huge compliment to our staff. Special thanks to the management company K & C Eigendom Management B.V. for the supervision of this tricky process. This addition provides us with a major presence in the Beatrixkwartier. De Kroon (2011) is situated in the Wijnhavenkwartier between Central Station and the Spui. 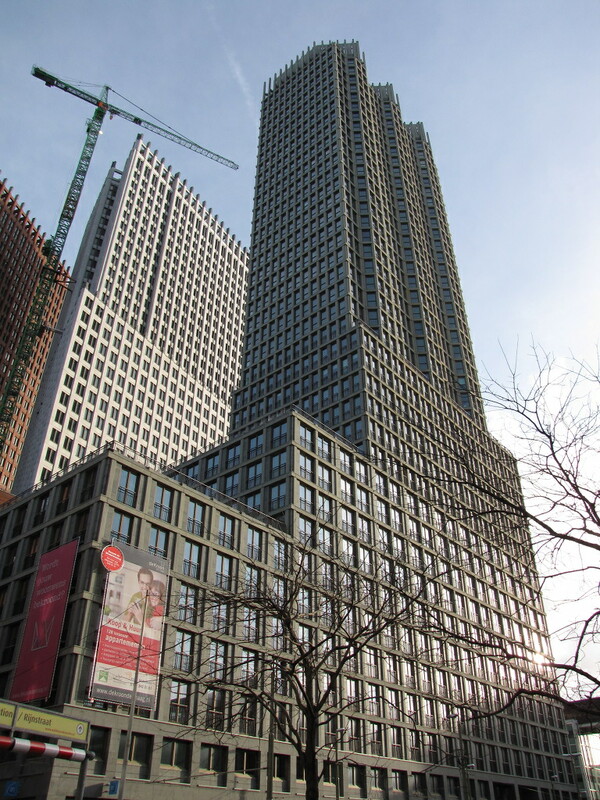 With 40 floors and reaching a height of 131.5 metres, it is one of the tallest buildings in The Hague. The design by architectural firm Rapp+Rapp was inspired by high-rise buildings constructed in Chicago between 1900 and 1930. De Kroon is on the south side of the two skyscrapers of the ministries of Security and Justice and Foreign Affairs and the Ministry of the Interior and Kingdom Relations. Careful consideration for the environment has played an important role within our service provision for many years. We are very aware that our work on facades and buildings has an impact on the environment. We strive to carry out each assignment as sustainably as possible, for example, by being aware of the amount of water we use, or by only using biodegradable materials. We have therefore also put high demands on our suppliers. Recently, in addition to the ISO 9001 quality certificate we had already acquired, we also scooped the ISO 14001 certificate and we are extremely proud of this fact! This international standard concerns all requirements for the implementation of an environmental management system within our company. The system helps us to better identify, manage, and improve all aspects of our business operations that affect the environment. Now we can constantly improve the sustainability of our service provision, and reduce negative effects on the environment. 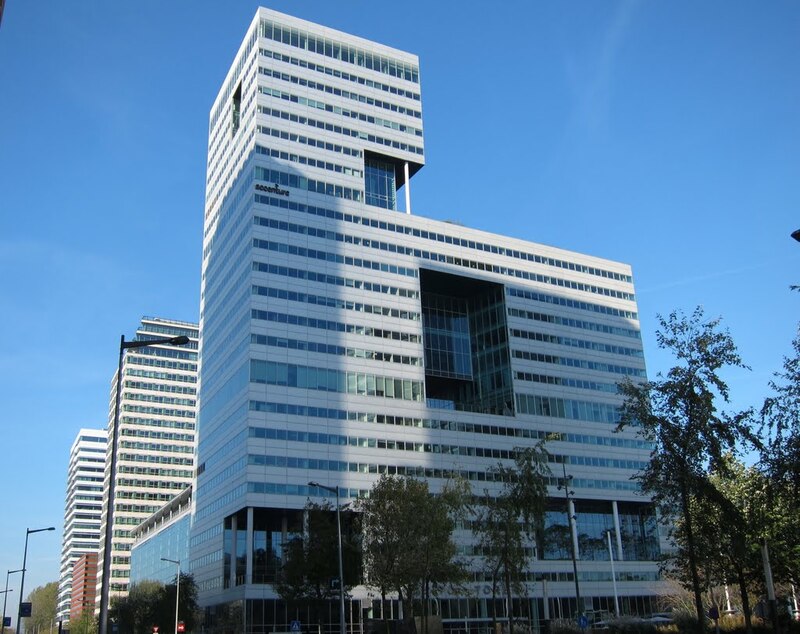 Anyone who has visited the Amsterdam Zuidas business district will immediately recognise both buildings: ITO and SOM. Two striking office buildings that are located next to each other, and are therefore frequently mentioned in the same breath. The ITO tower is 100 metres high and has a floor space of 34,000 m². 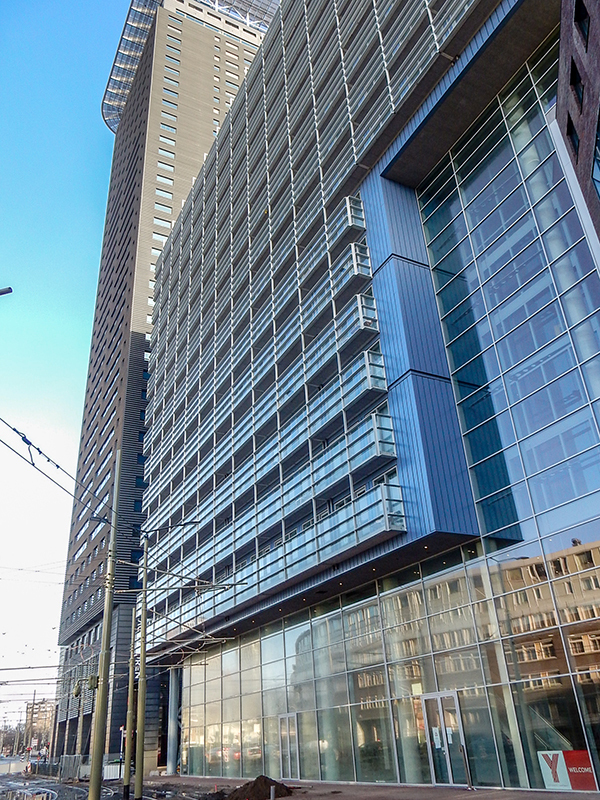 The office building is part of the Mahler4 complex, one of the projects that form the Amsterdam Zuidas. The SOM building has a total surface area of 18,000 m². We are cleaning all metal facade components of both buildings, as well as preserving these at the ITO tower, for management company Apleona (previously Bilfinger). Fortunately, because we are used to working at heights, we do not get vertigo from this wonderful new assignment! 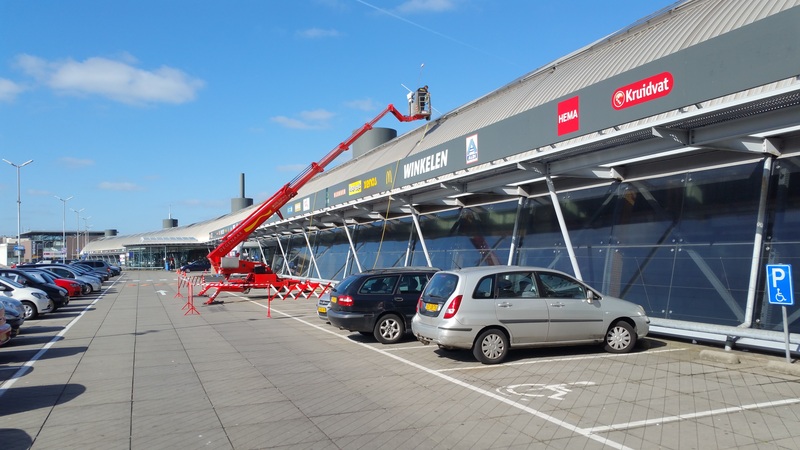 Today we added a new chassis mounted telescopic boom lift to our fleet of machines thanks to HDW Nederland from Ridderkerk: the Versalift VTX-240. This articulated telescopic boom has a maximum working height of 24 metres and has a unique property. In comparison to regular aerial work platforms that only extend vertically, the VTX-240 also has an outreach of 12.5 metres thanks to an articulation point at 11 metres. This allows us to reach places which would be impossible or troublesome with other AWPs. The Versalift has only been available in the Netherlands since April 2016. 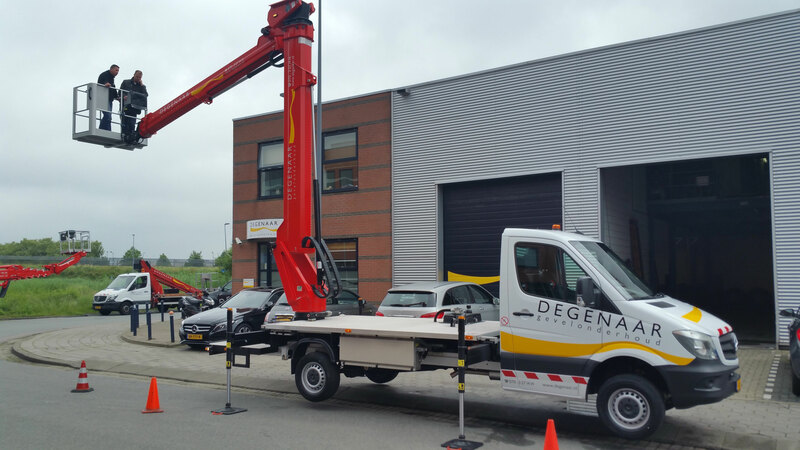 Degenaar is currently one of the few maintenance companies in the Netherlands that work with the Versalift. 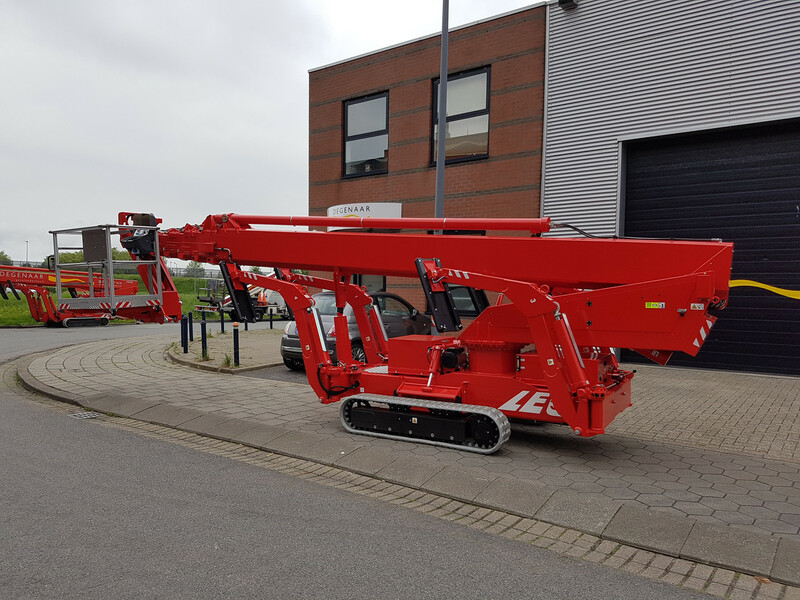 Today we started using our new Teupen LEO36T aerial work platform to replace our old machine of the same model, which gave us 11 years of loyal service. It is a unique machine with a maximum working height of 36 metres at a relatively low weight of approximately 5,000 kg. The AWP meets the latest technical requirements, also in terms of emissions. 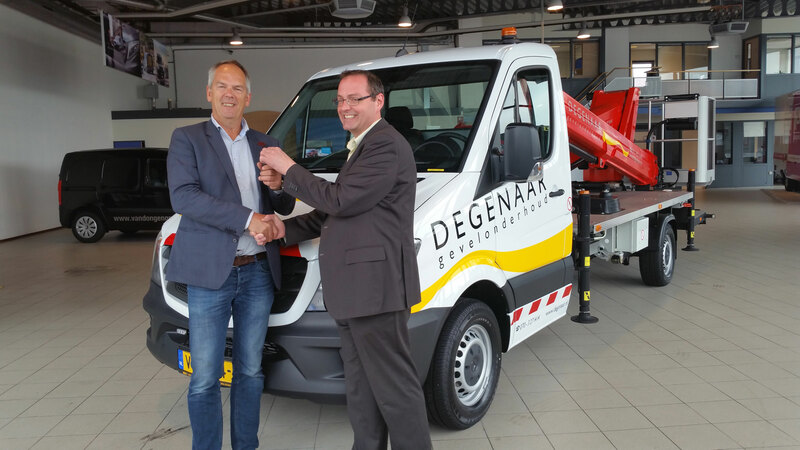 We offer our sincere thanks to Wilco Donkersloot from HDW Nederland B.V. for expert delivery and supervision. 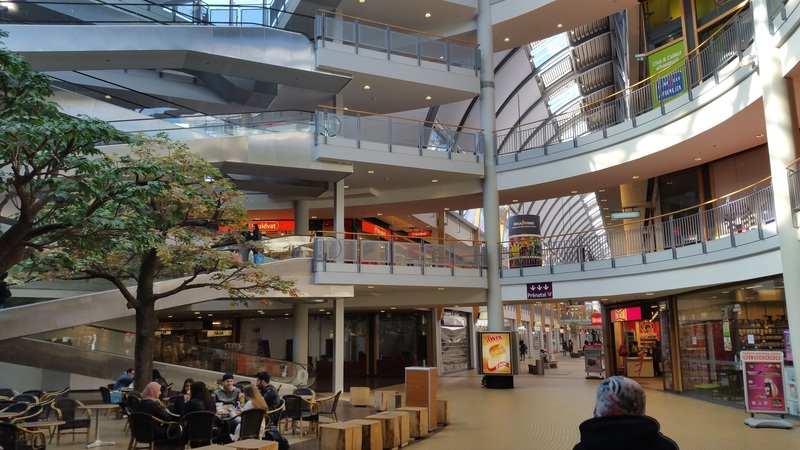 With an area of approximately 85,000 m², MegaStores The Hague is one of the Netherlands´ largest covered shopping centres. The complex contains approximately 50 stores including a large number of well-known home decor stores such as Beter Bed, Leen Bakker, Auping Plaza, Montèl but also stores such as Prénatal, BCC, Pets Place and Kids Eiland. Meijer Realty Partners (MRP) purchased the complex from ING Real Estate in April 2015.